This summer we were introduced to the re-launched Bailey's Backyard by Danny and Kristien of OmNomCT. From the cocktails, all the way through dessert we knew this was something special. Then, right around our wedding anniversary, we saw Bailey's had just created the new Fall menu. How convenient. Again, it was a magical meal experience from start to finish. So, when we were invited to a tasting dinner showcasing Fall menu items we knew it was the perfect time to finally share with all of you the farm-to-table passion of Bailey's Backyard. That's what shines through - passion. Owner Sal Bagliavio and Executive Chef Forrest Pasternack love what they are creating together and it shows. Sal opened Bailey's Backyard in 1999 and was the primary chef until this year when he decided it was time for a change. 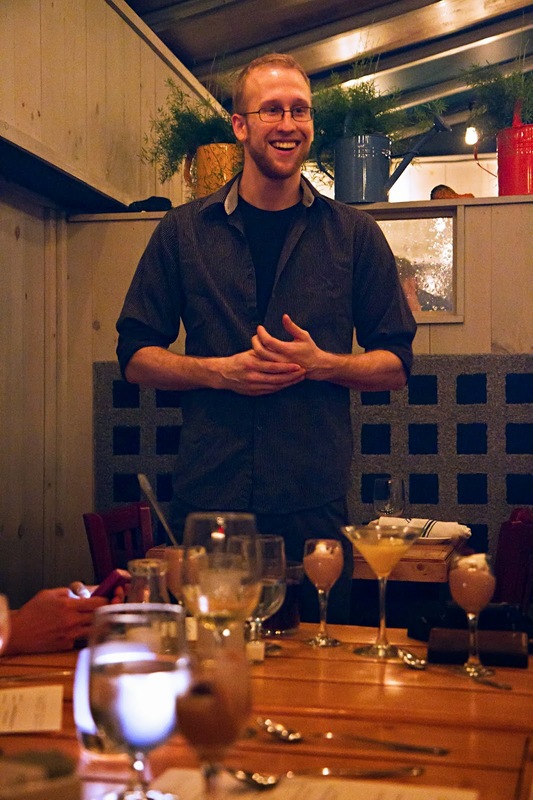 In early 2013 he brought on Chef Forrest to re-launch as a true farm to table restaurant. 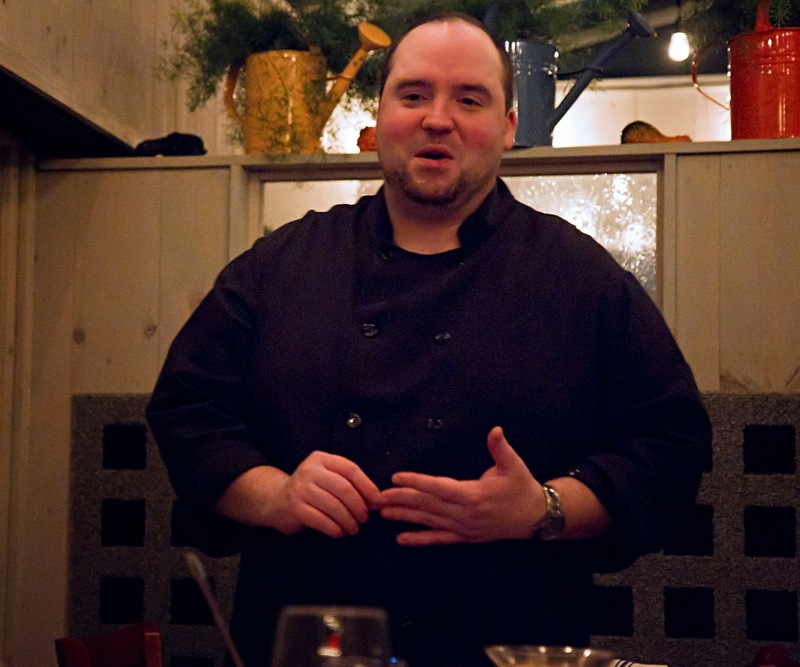 Chef Forrest, who grew up in Western Connecticut, graduated with honors from the Culinary Institute of America and has worked with some of the best chefs at some of New York’s finest restaurants. He's also been the chef at local favorites like Terra Restaurant and Morello Bistro, both in Greenwich. Together he and Sam whole-heartedly are committed to sourcing from area farms that use sustainable practices. Some of the local farms include Arethusa Farm (Litchfield, CT), Marble Valley Farm (Kent, CT), The Hickories (Ridgefield, CT), Ox Hollow Farm (Roxbury, CT), Greyledge Farm (Roxbury, CT), Halas Farms (Danbury, CT) and Veronica's Garden (Ridgefield, CT) among others. Their fresh seafood comes from waters off Connecticut, Massachusetts, New York and the Chesapeake Bay. Beyond sourcing locally, Chef Forrest also "puts things up" for winter by making his own pickles, relishes and jams. In addition, there are plans to create a serious herb garden on the roof next year. 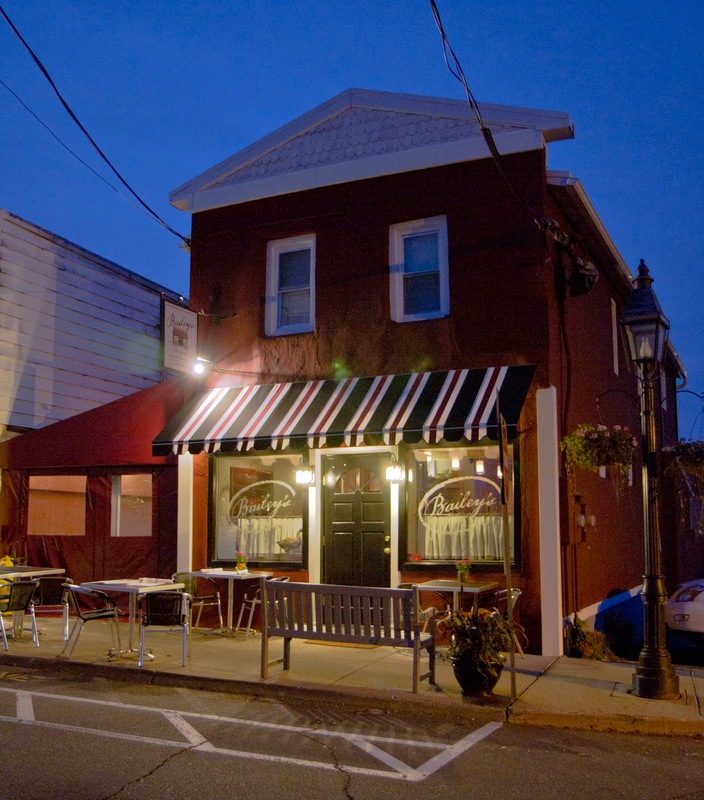 Bailey's is tucked into a quaint space on Bailey Avenue. The vibe is relaxed, inviting and friendly. The decor is a touch of farmhouse with high shelves displaying some of Chef Forrest's canned goodies. As you might expect, the menu rotates season to season with what's available. They serve lunch and dinner, plus brunch on Saturdays and Sundays. The dinner menu is divided up into a few sections: "for the table," sides, greens, starters, mains, burgers and desserts. At lunch they also offer sandwiches and wraps. At dinner they have a 7 Course Tasting Menu option, which is a great way to sample a cross-section of the latest and greatest items. Bryan Walsh is the resident drink master. We think he creates some of the best cocktails around! Seriously. His creative cocktails are made with house-made infused liqueur. Every one we've sampled over our handful of visits has been well-balanced and flavorful, never too strong or too sweet. This time we chose the Mark Twain Manhattan featuring vanilla-infused bourbon, house-made cinnamon syrup and a hint of maple syrup. This drink is made for Fall and boy does it go down smooth. On our anniversary we also tried the "Ginger Ringo" featuring ginger infused vodka, apple cider reduction, green apple puree and topped with ginger ale. It was crisp and lightly tart with a gentle fizz. They also feature small, craft domestic brews and recently expanded their wine list. 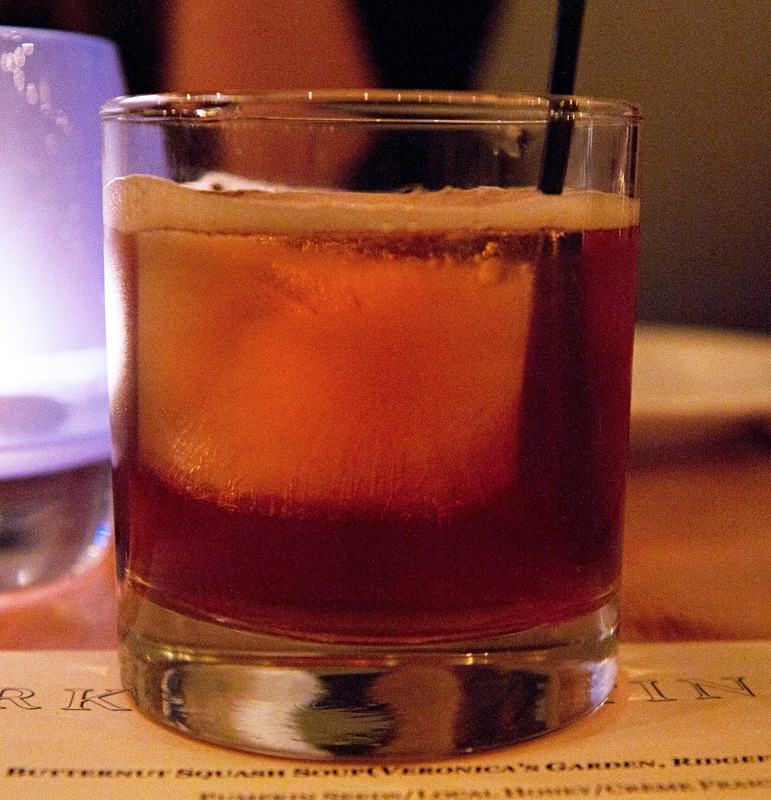 Just as the food menu is constantly evolving, so are the beverage options. Butternut Squash Soup with toasted pumpkin seeds, local honey and creme fraiche. 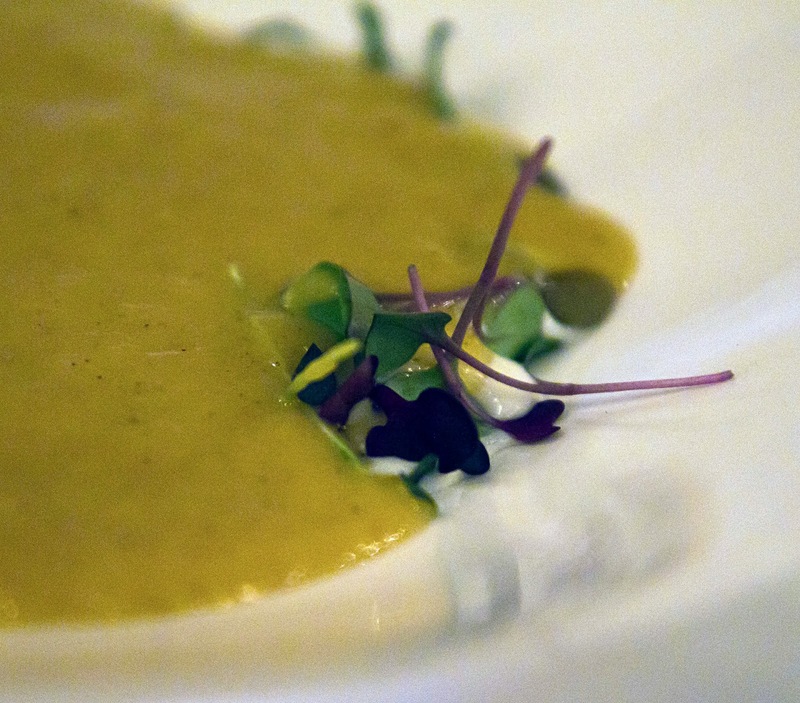 The pumpkin seeds offered a nice contrasting crunch to the creamy and smooth soup. There was also a subtle black pepper kick. 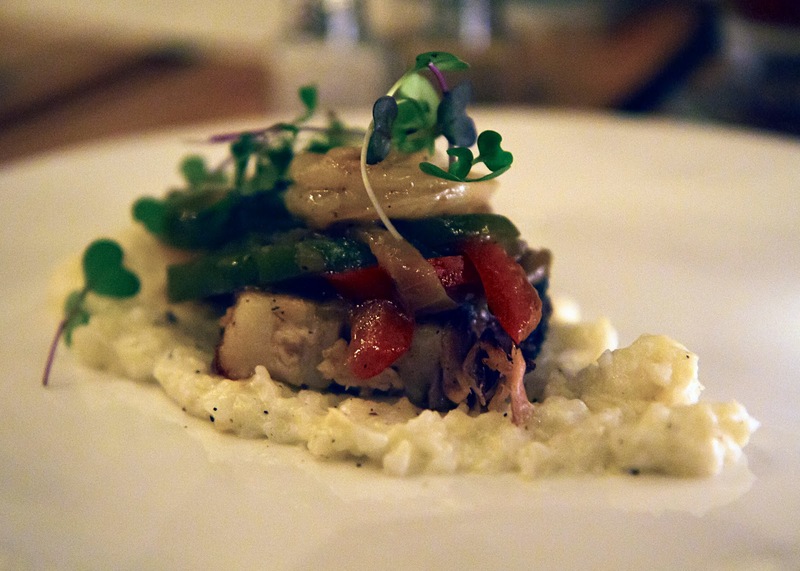 Slow Roasted Berkshire Pork Belly with baby pink shrimp, artisanal grits, and roasted bell peppers. How could I not like this dish? After all pork belly is a magical thing. This dish was just that, magical. Rich, melt in your mouth pork paired so well with the sweet, succulent shrimp and creamy (not pasty) grits. 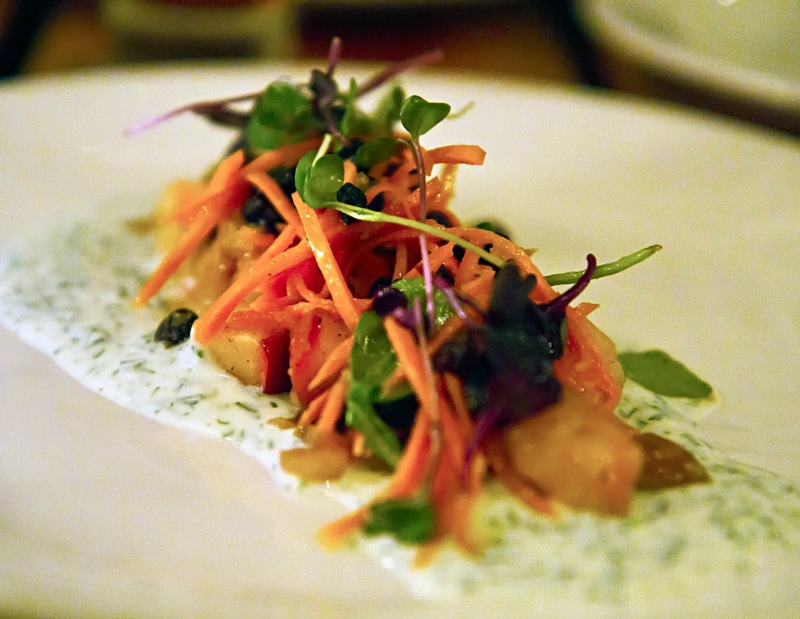 Roasted Ida Red Apple Salad with cinnamon carrots, Belgian endive, black currants, fresh dill and buttermilk dressing. The currants were soaked in Riesling and the dressing featured house-preserved lemon vinaigrette. This tasted like a crisp apple pie filling with a pop of herby freshness. It was refreshing and the perfect palate cleanser after the richness of the pork belly. 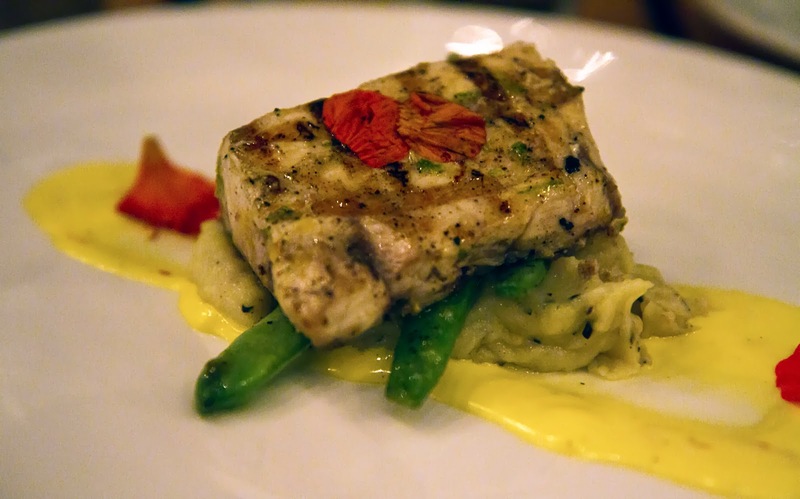 Citrus Marinated Swordfish with sauteed Romano beans and rosemary and Finnish potato puree. The swordfish was so fresh. In fact, it was caught off Boston that morning. I especially loved the touch of sprinkling edible nasturtiums on top. Classic flavors, but modern at the same time. 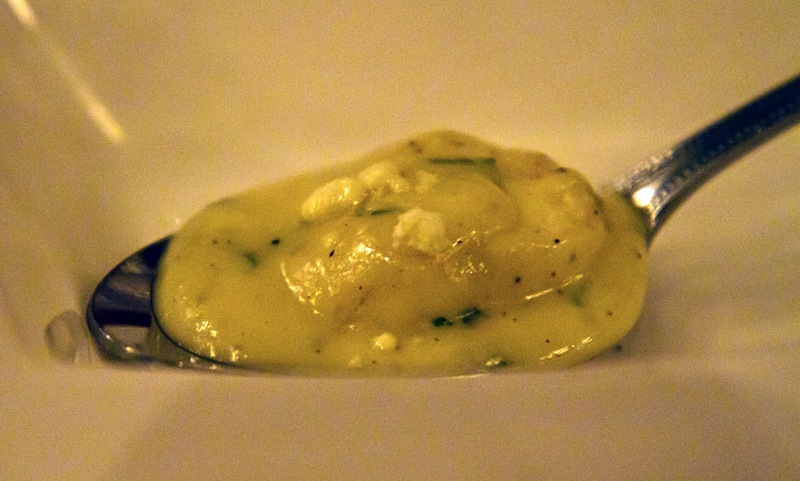 Then as a surprise amuse bouche - Herbed Ricotta Gnocchi with truffle powder. Silence fell over our table as everyone just took in this small bite. In my notes I wrote "rich pillow of goodness." It was decadent and SO good. 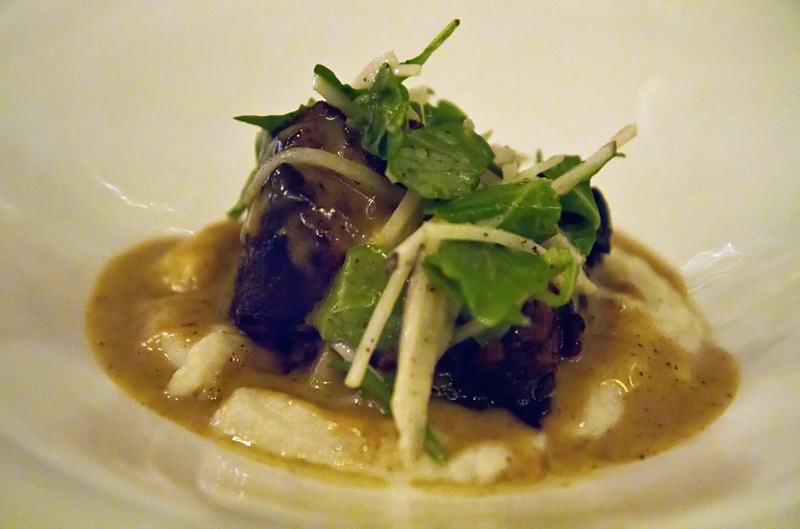 Balsamic-Glazed Boneless Short Ribs with Spanish black radish, gilfeather turnip puree, chick peas and smoked paprika. This dish should read "no knife necessary." This final main course of the evening was just fall apart, slow cooked comfort food. The heirloom turnip offered a unique, but not overpowering flavor. It paired well with our waitress' beer recommendation, Oskar Blues Mama's Litle Yella Pilsner. To round out the evening were two desserts - Nutella Mousse with whipped cream and chocolate crumble and Pumpkin Cloud 9 with brioche pain perdu and whipped pumpkin custard. Both desserts were light and not too sweet (they way I like my dessert as you all know). 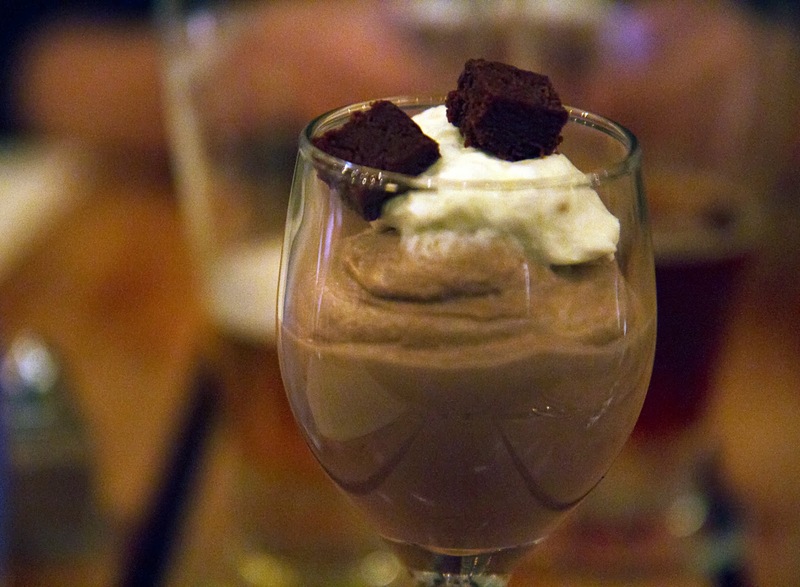 While the mousse was delicious, we simply adore the Pumpkin Cloud 9. 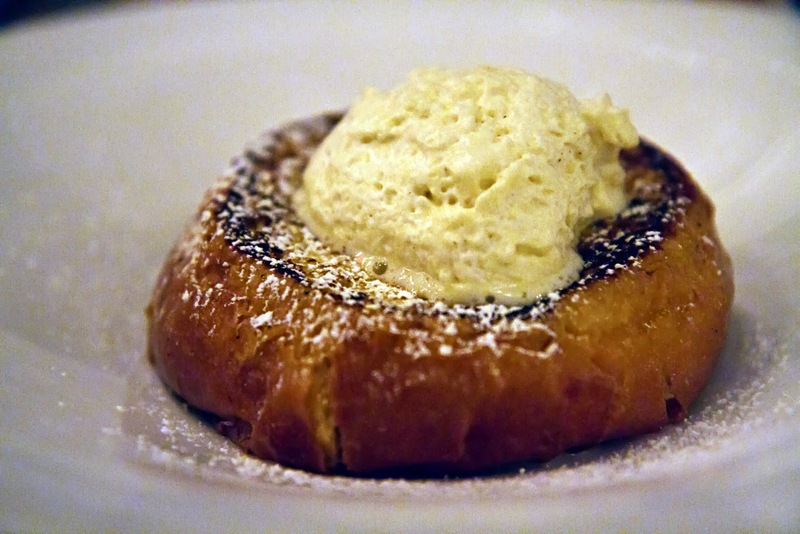 I remarked to Renato that the best way for me to describe it is "French toast on crack." Sure the food was amazing, but when Chef Forrest came out to explain each dish, you could see him get excited. His passion flows into everything from selecting the ingredients and where they came from all the way to the finished, plated dish. That just makes a meal something special. To quote Chef Forrest, farm-to-table eating is, "a movement, not just a trend. It makes sense. It tastes good." We could not agree more. For more photos from our Bailey's Backyard visit check out Local Food Rocks on Facebook. Disclaimer: I was not compensated for this post. This tasting meal was free of charge. The opinions contained herein are my own and reflect my experience. Your own may differ. 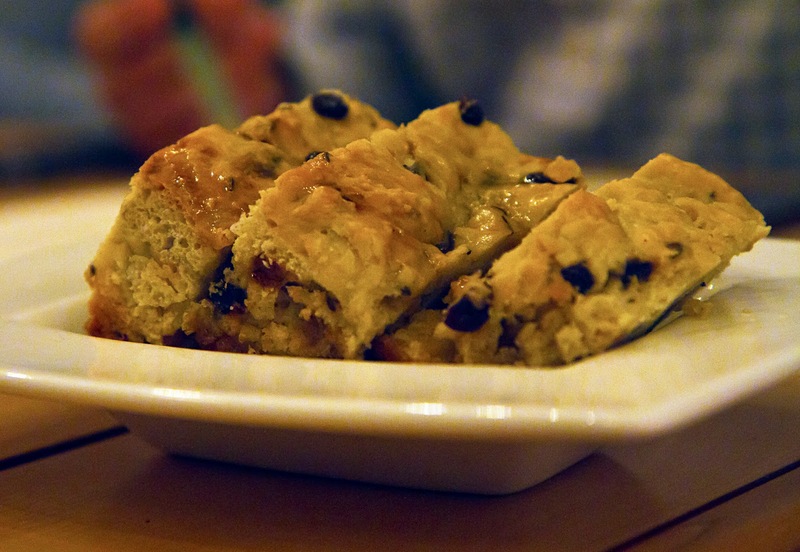 Wow, that soda bread pic (and the rest!) is making me hungry!